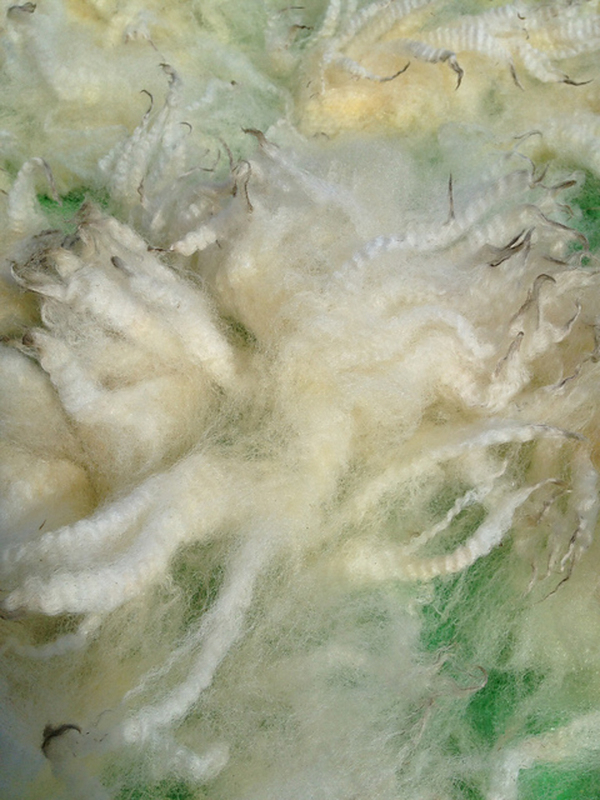 In week one of WOVEMBER we met Sally Antill who discussed the unique fleeces of the Soft Fell sheep that she and her husband, Michael, breed and their involvement in a fantastic community ‘sheep to shawl’ event, in Northumberland. Today Sally is here again to discuss the evolution of the breed, one which produces a meat for supermarket buyers and also yields a fleece popular with hand-spinners. Back in the day, when himself was a whippersnapper learning to farm alongside his dad, this farm – along with most other hill farms in the area – bred Blackies (Hexhamshire Blackface) and produced a crop of North of England Mule ewe lambs, as well as Blackie ewe lambs and their own replacements. Michael got into breeding in a big way and started to breed his own crossing Blue-faced Leicesters. 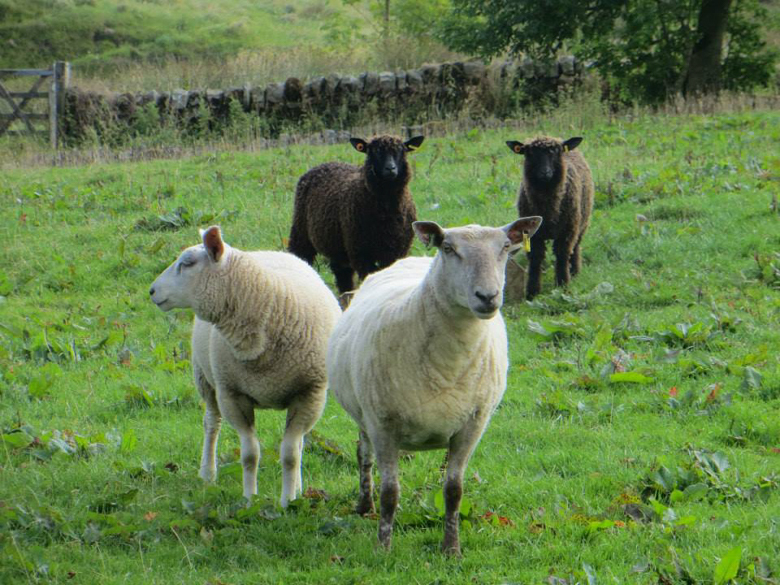 A crossing BFL needs to produce good North of England Mules, with well-marked faces, out of the hill ewe, and in order to do this he often has a touch of another breed. Some people use Teeswater, Michael found that the Derbyshire Gritstone gave a good result here. Farming began to change as the English subsidy system moved away from headage payments, and now it made sense to have less sheep but make more profit per sheep. 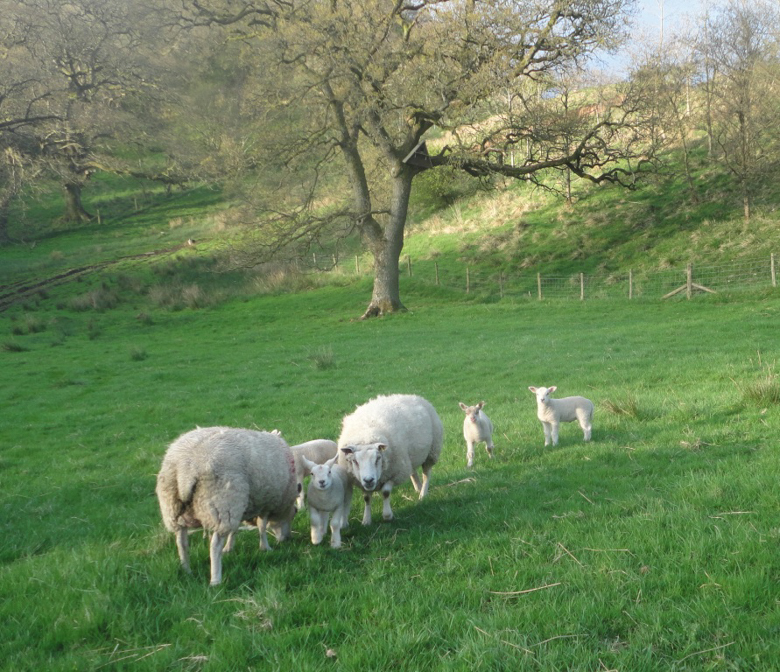 So Michael began to keep the Mules on, and put them to the Texel to create a fat lamb crop. The Texels seemed to do well here; he kept on some of the Texel crosses, and bred from them. Michael developed the farm now as a meat-producing farm, and eventually dropped the Blackies completely. 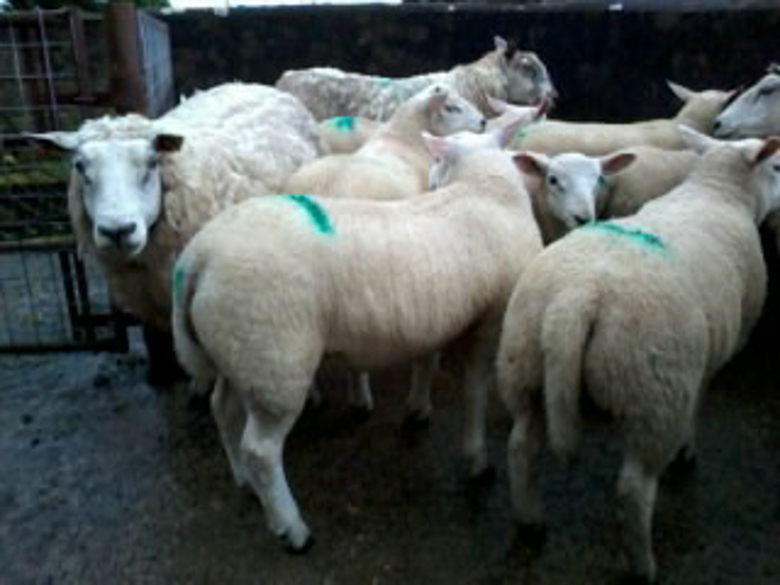 He bought a batch of Lleyn ewes to bring in milkiness, better feet, thriftiness. This worked brilliantly, but unfortunately the Lleyn is prone to triplets and quadruplets, and this isn’t a farm where it’s easy for a ewe to rear such litters, so he didn’t buy any more, and shelved his plans to get a Lleyn tup. 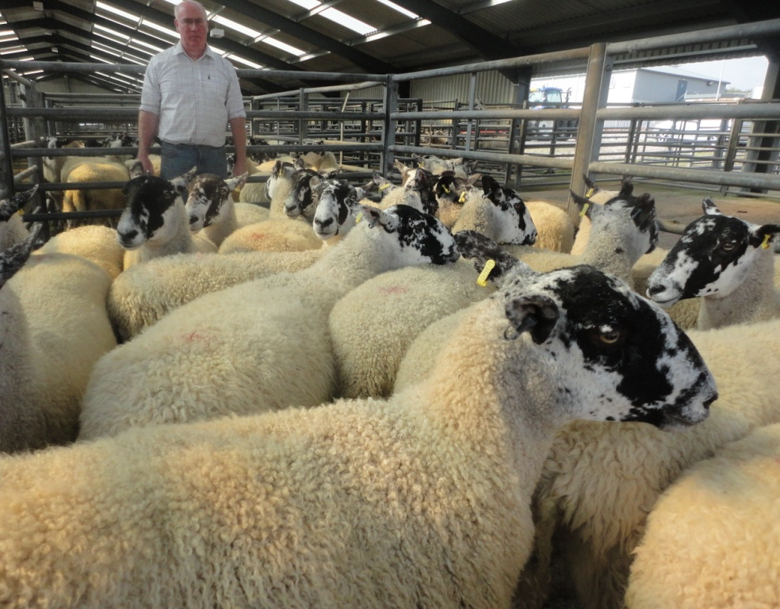 To get back up away from the pure-bred Texel, Michael bought in a batch of Texel x and Beltex x ewe lambs out of Swaledale x BFL ewes, bred on a moorland farm further up and out, so hardy stock. They did well and he bought another batch the same the following year. The crossing BFLs used on that farm were bred with a touch of Teeswater. Fleeces were the only real problem now, some of the fleeces were quite rough, and with big lambs the extra friction could cause a lambing to be rougher on the ewe. He bought a Charollais tup to lighten the fleece and improve the conformation. This worked brilliantly; that tup was joined by one of his grandsons, and most of the good ewe lambs were kept on. By now the two batches from the moorland farm were getting depleted, so he bought a batch of his own Swaley Mules (BFL x Swaledale) bred by a neighbour, to start the breeding cycle again. 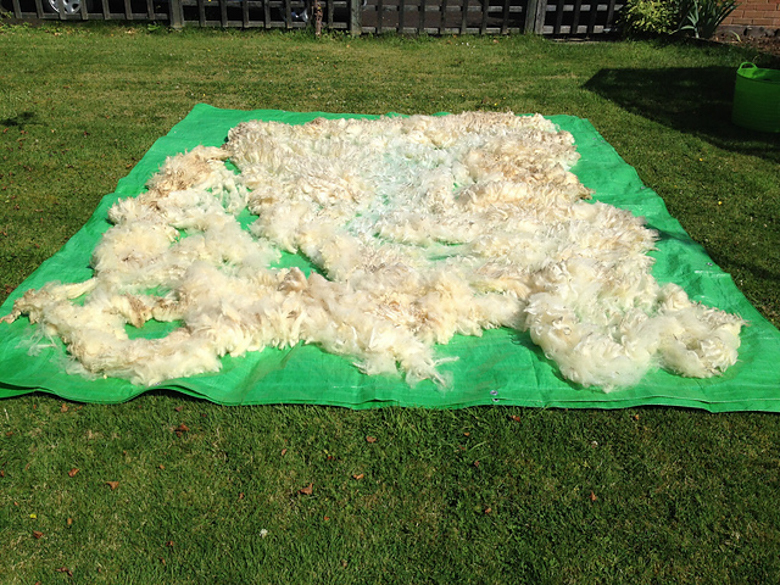 The latest pen of Mules we bought – following up on the best Mule fleeces at Woolfest! Dutch Texels were coming in, with finer fleeces and smaller than the now quite large standard Texels. He bought a Dutch Texel to put on his shearlings / first timers. This improved the fleeces again, plus the Dutch Texel doesn’t seem to have the problems with dopey lambs or lack of milk that the Texels can have. In the meantime, I’d started keeping what my father calls ‘geeps’ (goaty-looking sheep) and Michael calls my ‘funny little sheep’ – primitive types with lovely meat and nice fleeces for spinning, and had taken up spinning in order to make use of their fleeces. Thus it was, as I helped as usual at clipping time, that I realised that Michael’s commercial sheep had fleece that wanted to be spun. So the farmer’s quest for the ultimate upland fat lamb-producing ewe had, in its focus on that ‘fine skin’ so important for easy lambing but also sufficient for good weather protection, arrived at an animal with fleece that was fine enough, but not too fine, crimpy enough, but not to crimpy, and above all that drafted like a dream. 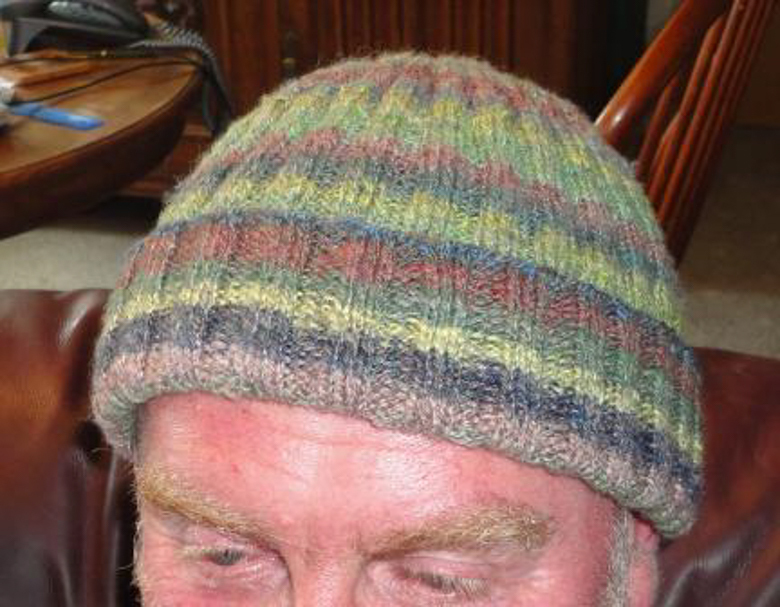 Early experiments with dyeing resulted in Michael’s‘rainbow hat, made from the fleece of his own sheep, rainbow dyed in the grease (unwashed prior to dyeing) and spun at home on my Rappard Wee Peggy spinning wheel. And the name? Up until earlier this year, it had no name, just ‘our commercial ewes’. Then a friend pointed out that it was hard for people to know what they were buying, and to share and interpret their experiences with it, when it hadn’t a name. The study group on Ravelry, Blacker and Beyond with Fleece & Fiber Sourcebook (BBF&FS to its friends) studied the Eider, which transpired to be the name of a type of sheep from a region in Germany, whose story was not dissimilar to the story of our own. Thinking about all this as I was out and about on uplands in our own region and also in the Scottish Borders, where the sheep show their Cheviot origin in the roman noses and longer ears, I began to ponder the name ‘Soft Fell’ for this type of sheep. Rough Fells are a hardy hill breed, capable of breeding in the harshest of hill environments; just one of the many black-faced hill breeds across this part of the country (various Blackfaces, Dalesbred, Swaledale, Lonk and Rough Fell – they are all pretty similar really.) Lower down, still upland but less harsh, the farmers seem generally to be moving towards a slightly less hardy but more productive ewe, with softer fleece and meatier lambs. So, Soft Fell. Her origins in the hill sheep of the reqion, with the influence of the longwool breed to create the local Mule or Half-bred, then the addition of the more meaty breeds to soften the ewe and improve the fat lamb. She thrives on the uplands and rougher ground lower down, hardier and thriftier than her downland counterpart. But living as she does, below the moorland line, with more shelter in the glens and woodlands than is available to her hill cousins, she has a finer fleece, but still with good staple length and crimp from her longwool ancestors.